La La Land is a 2016 American musical romantic comedy-drama film written and directed by Damien Chazelle. It stars Ryan Gosling as a jazz pianist and Emma Stone as an aspiring actress, who meet and fall in love in Los Angeles while pursuing their dreams. The film's title refers simultaneously to music, the city of Los Angeles, and to the idiom for being out of touch with reality. Chazelle wrote the screenplay in 2010 but did not find a studio willing to finance the production without changes to his design. Following the success of his 2014 film Whiplash, the project was picked up by Lionsgate Pictures. Filming took place from August to September 2015 in Los Angeles. La La Land was premiered at the 73rd Venice International Film Festival on August 31, 2016, and was released in the United States on December 9, 2016. It grossed $445 million worldwide on a production budget of $30 million. La La Land received critical acclaim. 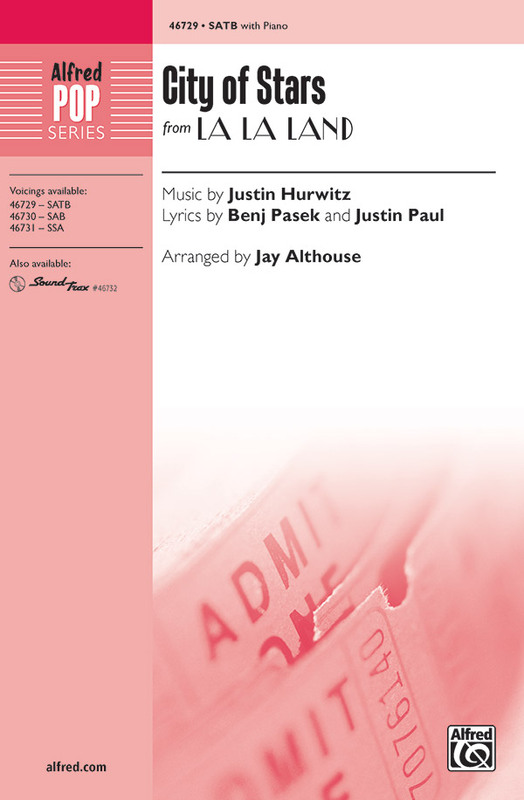 Critics praised Chazelle's screenplay and direction, Gosling and Stone's performances, Justin Hurwitz's score, and the film's musical numbers. It won in every category for which it was nominated at the 74th Golden Globe Awards, with a record-breaking seven wins, and received 11 nominations at the 70th British Academy Film Awards, winning five. It received 14 nominations at the 89th Academy Awards, tying the record for most nominations with All About Eve (1950) and Titanic (1997), and won six Academy Awards for Best Director, Best Actress (Stone), Best Cinematography, Best Original Score, Best Original Song ("City of Stars"), and Best Production Design. 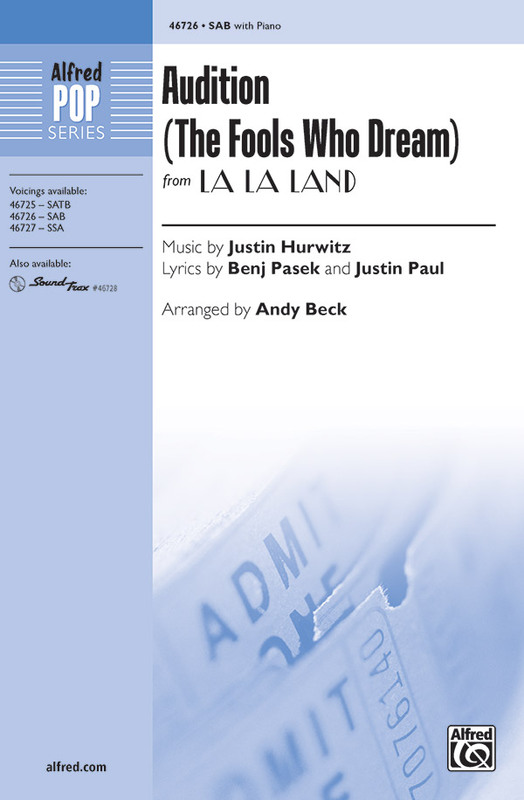 6 selections from the Academy Award-winning movie musical are presented in this book which includes the lyrics, vocal line and chord labels for each song, plus online audio tracks featuring authentic-sounding re-creations of the original orchestrations from the soundtrack. And the Oscar goes to ... "City of Stars", the signature song from critically acclaimed and highly awarded La La Land. Winner of Best Original Song at the Academy Awards, the Golden Globes, and the Critic's Choice Movie Awards, this melancholy yet hopeful ballad features a haunting tune and a distinctive piano accompaniment that are instantly recognizable and extremely well suited for choral groups. Here's the optimistic opening number "Another Day of Sun". Who can forget those boisterous singing and dancing motorists on L.A.'s jammed 110 freeway at the start of the 2016 box office smash? This dynamic arrangement captures the excitement of the score with rhythmic drive, varied choral textures, and a rousing accompaniment. A perfect opener or closer, and a golden opportunity for choreography! "Someone in the Crowd" - The cast of gets all dolled up and heads to a lavish Hollywood Hills party during this big production number from the hugely successful motion picture. The lively tempo, jazzy feel, and cheeky lyrics are fantastically fun and fuel the fire to become (or find) that someone special amongst a crowd of hopefuls. Great for all choirs, and especially girls' groups! The stunning song "Audition (The Fools Who Dream)" was an emotional showcase for actress Emma Stone in her award-winning performance as Mia in the 2016 blockbuster La La Land. Nominated for Best Original Song at the 89th Academy Awards, the poignant piece tells the story of one woman's life and acknowledges the dreamer in all of us. A beautiful choral setting of a very special song. 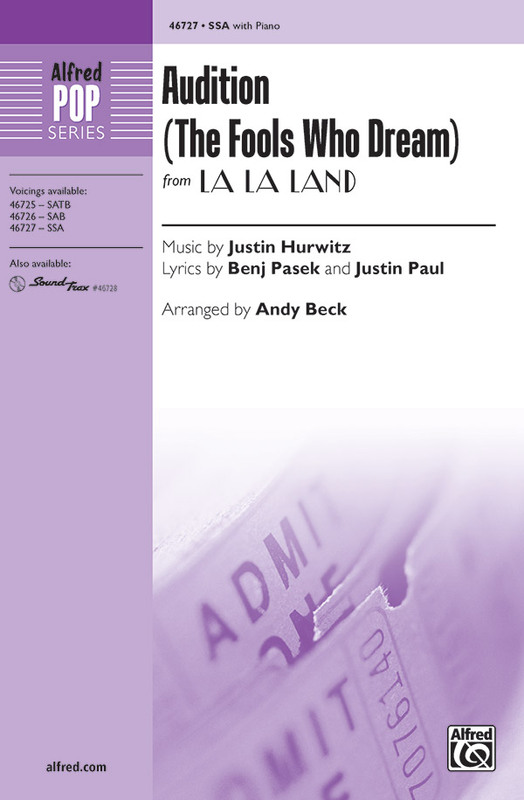 La La Land has taken the silver screen by storm with seven Golden Globe Awards and fourteen Academy Award nominations - including nominations for the score and original songs composed by Justin Hurwitz with lyrics by Benj Pasek and Justin Paul. 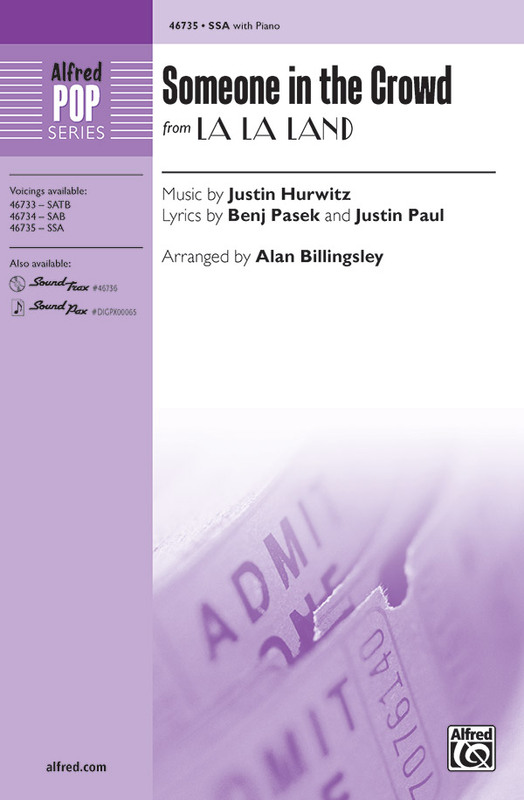 This vocal selections folio features six vocal arrangements with piano accompaniment. Here's the optimistic opening number from. Who can forget those boisterous singing and dancing motorists on L.A.'s jammed 110 freeway at the start of the 2016 box office smash? This dynamic arrangement captures the excitement of the score with rhythmic drive, varied choral textures, and a rousing accompaniment. A perfect opener or closer, and a golden opportunity for choreography! And the Oscar goes to ... this, the signature song from critically acclaimed and highly awarded La La Land. 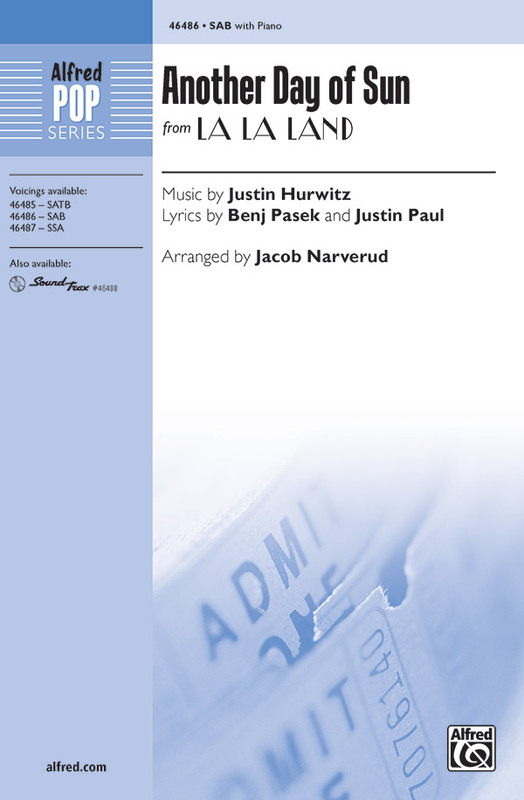 Winner of Best Original Song at the Academy Awards, the Golden Globes, and the Critic's Choice Movie Awards, this melancholy yet hopeful ballad features a haunting tune and a distinctive piano accompaniment that are instantly recognizable and extremely well suited for choral groups. The cast of gets all dolled up and heads to a lavish Hollywood Hills party during this big production number from the hugely successful motion picture. The lively tempo, jazzy feel, and cheeky lyrics are fantastically fun and fuel the fire to become (or find) that someone special amongst a crowd of hopefuls. Great for all choirs, and especially girls' groups! This stunning song was an emotional showcase for actress Emma Stone in her award-winning performance as Mia in the 2016 blockbuster La La Land. Nominated for Best Original Song at the 89th Academy Awards, the poignant piece tells the story of one woman's life and acknowledges the dreamer in all of us. A beautiful choral setting of a very special song. This signature song by John Legend is from the 2016 cinematic tribute to Los Angeles La La Land and captures the funny and charming mood of the film through a jazz/pop fusion that is totally irresistible! A perfect selection for choirs of all ages! This stunning song was an emotional showcase for actress Emma Stone in her award-winning performance as Mia in the 2016 blockbuster La La Land. Nominated for Best Original Song at the 89th Academy Awardsae, the poignant piece tells the story of one woman's life and acknowledges the dreamer in all of us. A beautiful choral setting of a very special song. And the Oscar goes to . . . this, the signature song from critically acclaimed and highly awarded La La Land. Winner of Best Original Song at the Academy Awardsae, the Golden Globes, and the Critic's Choice Movie Awards, this melancholy yet hopeful ballad features a haunting tune and a distinctive piano accompaniment that are instantly recognizable and extremely well suited for choral groups. The cast of La La Land gets all dolled up and heads to a lavish Hollywood Hills party during this big production number from the hugely successful motion picture. The lively tempo, jazzy feel, and cheeky lyrics are fantastically fun and fuel the fire to become (or find) that someone special amongst a crowd of hopefuls. Great for all choirs, and especially girls' groups!